Bow to Your Robot Overlor… Er, We Mean, Check Out This Butler and Housemaid of Tomorrow! We’ve joked about the robocalypse a lot, but robot tech really is developing at one hell of a clip. And you may be rubbing, um, shoulders with robo-house assistants sooner than you think, as two recent developments from France and Japan remind us. First up is France’s Robosoft with Kompai, who’s specifically designed to assist old people at home, with a nod toward the well-known “aging population” problem that’s facing developed nations–Japan in particular. (Just be sure to keep your Old Glory robot insurance policy paid up.) There’ve been several prototype devices over the years that aim to do the same sort of things as Kompai, but they totally lack the simplicity and, let’s face it, panache that Kompai demonstrates. He’s designed to be super-simple to interact with, with a plain PC screen and a massively voice-centric control system. Check him out in the video below, where you should be impressed at how clever the thing is, and how potentially useful in the home, even if his potential is somewhat stymied by the lack of arms. Did anyone else get slightly creepy reminders of Serge, the similarly-shaped, and similarly eloquent robo-butler from Caprica? 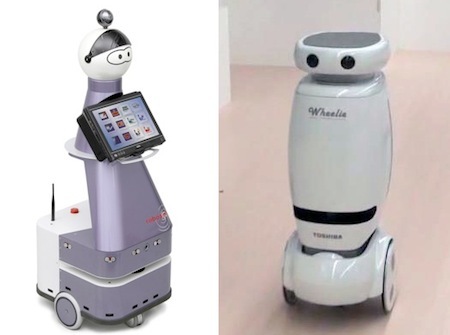 But while Kompai is quite definitely designed to serve mankind in a caring, sharing role, Toshiba’s Wheelie–also a tall, narrow wheeled robot–has more materialistic aims. In a recent demonstration, it looks like the Wheelie machines, which are no-doubt jam-packed with mega-clever electronics to help them balance and navigate their way around your home, have no more exalted a task than ferrying around your TV dinner from microwave to couch, or possibly whisking hors d’ouvres and champers among your guests at a dinner party. I, for one, welcome the arrival of our robot underlings.